As designers who work with technology, part of our role is to explore the limits of what is possible and to have a point of view about the society in which we live. In a world of networked systems and ubiquitous computing alongside an ever increasing trend for convenience and efficiency, some of the human connection in life is being lost. Although some might argue that technology is bringing us closer together, the threat around giving away too much control is all too real, especially given the growing pervasiveness of AI and chatbots. 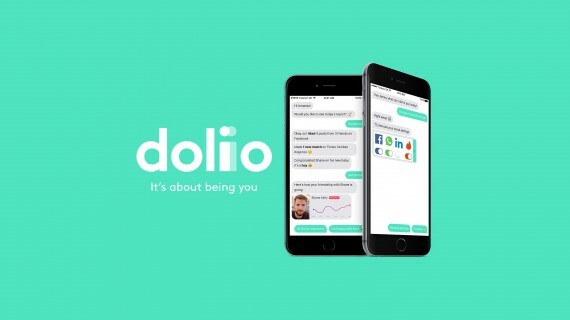 By creating a fictional application called Doliio, we wanted to highlight this risk to personal connections and demonstrate how willing people are to abandon the responsibility of building and maintaining human to human relationships. In order to put our ideas across effectively, the project had to be built in an extremely realistic way, which meant creating a universe around the Doliio service. This included a series of videos, a website, medium blog, social media handles and several new technology acronyms such as ASA (Autonomous Self-Agent). For Doliio we imagined an AI-powered system which would utilise user data to build a personality profile, similar to services such as CrystalKnows, in an attempt to ‘become’ the user. The user is assigned an ASA, which is able to act on their behalf across all online channels that the user gives it access to. Interacting with the ASA involves a chat based interface, designed to be as invisible as possible, giving the user simple updates on activity rather than transparent controls. In the end, Doliio was featured in publications such as Der Spiegel and Motherboard, with journalists pointing at the consequences that applications of this nature would cause. It created debate at conferences where we presented ideas and ultimately generated the right kinds of discussions amongst designers, technologists as well as the general public.